Blue Bag or Spring Green? As soon as I said it, I knew it would someday become the title of a book. Between 2 Purses. I really am, and it is also the metaphor for my life. Always in transition. Kind of disorganized. Usually missing something I need at the moment. Carrying too much stuff that I don’t. And when I go away for the weekend, inevitably, I have to bring 2 purses with me. I could be like my mom and carry a small one that fits inside a larger one. I think she is far more practical that way. I carry two that are roughly the same size. Both are from Target. I’m trying to diversify my wardrobe so that not everything is from Target. But for now, both the purses are. 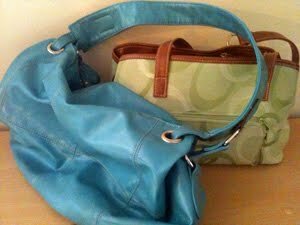 One is a beautiful blue fake leather bag that is too big and one large pouch. Can’t ever get to my phone before the call goes to voice mail. The other is a three pocket, more civilized square bag that promises order and efficiency, in a refreshing spring green with circles motif. I’m leaning towards the green one. I hope to get to it this weekend.